If you want to get free traffic from social sites, you have to look beyond Facebook. In today’s episode of Marketing in Minutes I will take a look at two social networks that are currently underutilized by marketers. 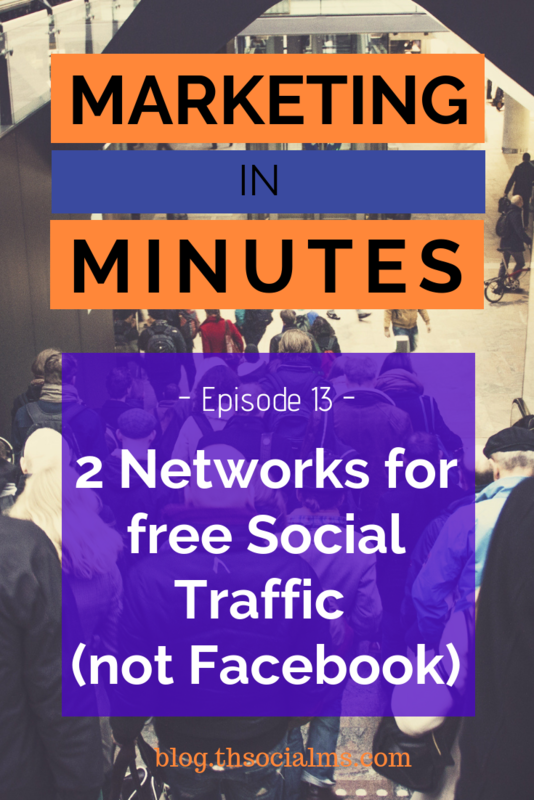 In this episode of Marketing in Minutes you will learn about 2 social networks you should absolutely work with to get FREE traffic from social media! 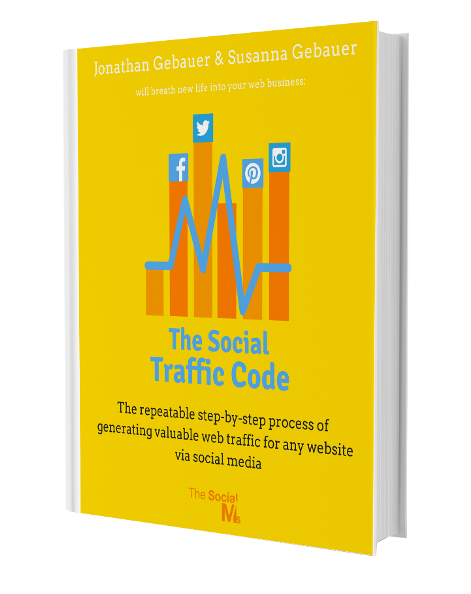 And if you want in-depth social media marketing and content marketing advice, buy our book, The Social Traffic Code. Below you will find the full transcript of today’s episode. How can you get free traffic from social media? The first thing you need to understand is that social traffic doesn’t only come from Facebook. In fact, getting free traffic from Facebook is very hard. Today, let’s talk about two networks that marketers often forget when they try to get free traffic. Welcome back to Marketing in Minutes by The Social Ms. I’m your host Jonathan Gebauer and in every episode, I give you one marketing topic in a nutshell. Today, let’s talk about two social networks you can get free traffic from and that aren’t Facebook. So you have a website that needs traffic. And you are on a budget – meaning that you can’t afford to advertise. Or maybe you are not on a budget – but you need to make money on every dollar you spend. So advertising is risky. It’s easier then you think. But you have to think outside of the box – or in other words: Outside of Facebook. That might seem counterintuitive… After all, Facebook still provides 60 percent of marketers the most social traffic on their sites. At least according to a recent article on Search Engine Journal. And that’s not even surprising – Facebook now has about 2 billion users. But that’s not the full story. What that number doesn’t tell you is how big the competition is and how much of that traffic is paid traffic. Because Facebook is really good at making you pay for the traffic. So: Forget about Facebook. At least if you are not willing to pay for it. Getting free traffic through Facebook was always hard – but today it’s almost impossible. Especially when you are a small player. Go for networks that are more niche friendly. When I started out in online marketing I was clueless. That was back in 2010 and the hottest social media platforms were Facebook and Twitter. Clueless as I was I tried everything on both of them. At the time, I didn’t understand Twitter. So I decided to focus on Facebook. That turned out to be a big mistake. A year later it turned out that Twitter, and not Facebook, was the solution to all my traffic problems. And even today, Twitter is still great for getting targeted social media traffic. * Twitter has conversations about any topic. So whatever your niche is, you can tap into these conversations and get traffic. * Twitter is a very active social network, so you can find these conversations at any point in time. * And Twitter is also unfiltered – which means that there is no algorithm which decides whether your Tweet is seen or not. Every tweet has the same chance to be seen by your audience. Jeff Bullas – one of the most impressive marketing bloggers, once called Twitter the “best niche marketing tool ever invented” – and he is probably right. Twitter still has the power to drive tons of traffic to your site – and is underutilized by most marketers. But that doesn’t mean it’s the only social network that can drive traffic… Twitter is great for driving a very targeted, constant traffic stream to your site. But it’s not good at getting you massive traffic for a few highly optimized content pieces similar to the type of traffic you can get through SEO. For that, you need to use a different social platform. Pinterest is different to other social networks because it’s … because it’s not really a network at all. Sure, you can follow people on Pinterest – but only very few posts in Pinterest’s smart feed are really from your followers. In fact, Pinterest is just really good at figuring out what you want to see and showing it to you. Some marketers say that Pinterest is a search engine – but that’s not really correct either. I would call Pinterest a social discovery site – which means it has elements of both search engines and social networks. What’s important is that Pinterest helps it’s users find content they want to see. According to the same article on search engine journal, Pinterest only provides 6 percent of marketers with the most social traffic. But, those who did work out how to get traffic from Pinterest really get a lot of traffic. Melyssa Griffin is one of the top marketers out there, and she built an email list of 200.000 people and massive traffic almost exclusively from using Pinterest. 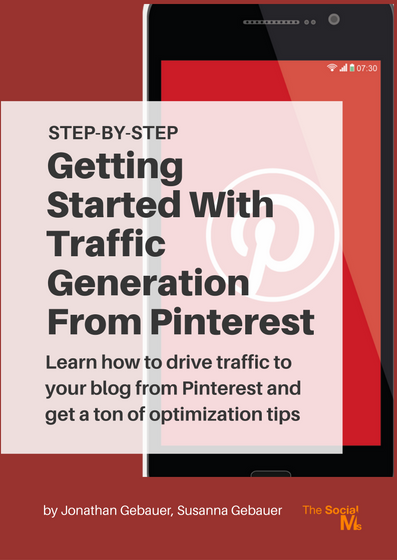 So, what do you need to know to get traffic from Pinterest? The key to Pinterest is not that you have to have great looking images. It doesn’t hurt if they look good, but there certainly isn’t a need to hire a designer. * Your images should always be designed to work like call-to-action buttons… Which basically means that they should make your target audience curious about the content behind them. A good way to do this is to put the title of the post of content on the image you share on Pinterest. * Your focus should be on optimizing your pins for Pinterest – which means you should focus on letting Pinterest know what they are about. In that way Pinterest works similar to a search engine – meaning that you should focus on using keywords. * To really push your pins in Pinterest’s Smart Feed, they need an initial push – meaning you need to push them to an audience. Your own followers won’t be enough for that, but what you can do is use Group Boards on Pinterest. There are group boards for almost any niche and you need to apply to them to be allowed to take part. But once you are accepted, you will be able to use them to push your best content to a bigger audience. That are the three most important ideas about using Pinterest to get traffic. Contrary to Twitter you won’t get traffic to all your post consistently – the traffic you get from Pinterest will be focused on a few successful posts at first and then grow. It takes a couple of weeks or even months to get there – but it’s totally worth it. I’m not a fan of focusing on just one traffic source – but the combination of using Twitter and Pinterest as your secret weapons is really powerful. And both networks are currently underutilized for traffic generation. You should really make use of them now. I hope you enjoyed this episode of Marketing in Minutes. For more information on how to grow an audience on Twitter and how to grow your traffic from Pinterest, take a look at the shownotes – which you can find at blog.thesocialms.com/MiM-13. 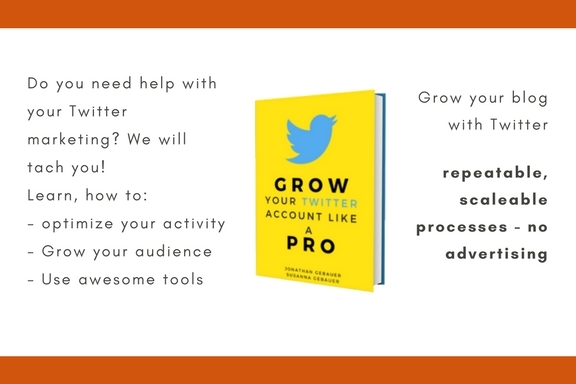 And if you need step-by-step instructions, please check out our book Grow Your Twitter Account Like A Pro and our Pinterest Workbook. Links to both can be found in the shownotes as well. Please subscribe to the podcast and let me know what you think. I’m Jonathan Gebauer and you’ve been listening to Marketing in Minutes. That’s it for today – take care. Bye!